Have I got a treat for you, and it’s better than catnip. I have a purranormal cat detective here to cat chat with me today. My name is Spam, because my feral father’s hobby is making copies of himself with all of the unaltered lady cats in town. There are long haired ginger cats and kittens everywhere you look. My two-legged author’s name is Elizabeth Ann Scarborough but she let her cat cultural consultant, K.B. Dundee (aka Kittibits) take top billing on my first book. What book(s) have you appeared in and what genre are they? 4.-4.5 Spam and the Sasquatch This case was the basis for a short story my illustrator, Karen Gillmore, used to create a graphic novel privately released. My author has also released it as an unillustrated short story. Spam, the Spooks, and the UPS Bandit, a Christmas short story for an anthology called Naughty or Nice for the benefit of the Cystic Fibrosis foundation. Now available as an individual short story. I’m actually based on two cats. K.B.Dundee or Kittibits is responsible for my appearance, because when our mom/author first moved to town she was often visited by a long-furred ginger tabby who would have been beautiful except that he was a feral with dreadlocks. This apparently didn’t lessen his appeal for the ladies because the day mom/author went to the shelter to look for a kitten, there were four, including Kittibits, who looked just like the old dude, and she’s seen many others since then. In Father Christmas Dreadlocks Cat (called Hank in my books) gets the brakes put on his reproductive pastimes, after being haunted by the erstwhile mates of Christmases past and present. My personality is based on another, more intrepid family member, Cisco, who is courageous, conscientious, and curious, a much better combination for a cat detective than Kittibits’, since he responded to every perceived threat by hiding under the bed. Please tell me more. Can you share an excerpt from one of your books that feature you in an important scene? If so, please include it. But once outside, back in the howling wind and rain, I panicked. It was cold out here. I had been going to search more but my paws refused to do anything except backtrack toward our house, toward food and family. Then I reminded myself why I was out there and crossed through the neighbor’s yard to the back fence, where the big dog lay sleeping. I could almost see the death rays spreading out all around his body, threatening to zap pesky cats in half just for gazing upon him. “mew,” I said, then adjusted my courage and my volume. “Er, mew? Sir? I am your next door neighbor, name of Spam, and I just wanted to come over and tell you how much safer my friends and I all feel with you standing guard over here all the time.” Okay, so I was laying it on a little thick but the Dog Whisperer said stuff about how dogs liked recognition for doing their jobs and responded well to positive reinforcement. An ear came up, then a nose, then an eye opened. I thought he would bark me halfway across the lot but instead he glanced at me, got to his paws and stood at facing me. “You woke me up to tell me that?” he asked gruffly. “A cat problem?” he asked, not sounding exactly flattered to be consulted. “If I did, what could you do about it, Punk?” He barked a lot more aggressively than was called for. “What time did she leave the house?” he asked. “Why does she do that?” he asked. “Dunno,” I said. I had wondered about that myself. Why did she have to go off someplace to do what she could have done at home on our computer here? Did she know that I secretly use it while she’s gone and she wanted to give me some quality time on it to do my blog, maybe check my own email? Or was she meeting clients or friends she played games with? I felt a stab of jealousy about her life outside the house, the life we knew nothing about, the part of her life that she led without our supervision. I couldn’t see what that had to do with anything. She was gone and something had come to the door and something else had taken our computer. What did Darcy’s mood have to do with that? “The woods, Yeah, yeah, what else?” I asked, washing my other paw as if straightening its fur would straighten out my tumbling thoughts. “Yes, and, er, on the nights before and after that incident there was other unusual activity, on both occasions occurring at around 2400 hours.” He whined. “I was alerted to the disturbance in your yard on the first night, despite the high wind and driving rain, by the smell of something dead. The wind was from the east and blew the scent right into my yard. Visibility was very poor, however, and by the time I reached the fence, I could see little except for something that seemed to be flying away, in the direction of the woods. The following morning, the primary subject of your inquiry presumedly entered the woods, as I stated previously. “That would be our laptop and some of Darcy’s stuff,” I said. I said, “I actually saw them too but I’m not a trained attack animal like you. I couldn’t do anything to stop them.” If only I’d known what was going to happen later maybe I could have organized all the bigger cats to gang up on them and hold them down until help could come, but human help hadn’t been around for a couple of days. No, it wouldn’t have worked. “I wish everybody would stop talking about coyotes,” I spat. Purrfect! I am clapping my paws at that wonderful scene. What do you like most about your role in your author’s books? In my books, after my first adventure where I escaped the house on the heels of burglars in order to rescue my human, who has been kidnapped by a vampire, I am given my own key to my personal cat door and trusted to go out to solve my cases around town. I’m never exactly alone, of course. I’m usually accompanied by my assistant, a larcenous raccoon named Renfrew who helps me with my cases by stealing any shiny clues like cell phones. Also, I get a lot of help by the local members of the Port Deception deer herd, who are everywhere in town and hear more than anyone thinks. They’re my version of Holmes’ Baker Street Irregulars and also occasionally provide me with taxi service to reach far-flung destinations quicker than my paws can carry me. Sometimes I get help from my coyote-hunting housemate, a vampire cat named Rocky, who was turned while defending our home and now sleeps upside down in the corner cupboard in the kitchen. The former police dog next door, Officer Bubba, provides me with law enforcement advice. Sometimes the wild things even bring me cases, like when Ma Eagle was worried about the threat she thought the Sasquatch might pose to her babies. Then there’s Maddog, who is sort of human, though a vampire. He’s a good one though, a crypto-biologist, fisherman and secretly Vamp Law South of the (Canadian) Border. When I meet up with him, we often go for fish ‘n’ chips. What a cool cast of characters. I’m not a talking cat like Joe Grey in the Shirley Rousseau Murphy series. The only human I can converse with is Maddog, who’s a magical kind of guy and telepathic besides. But the other critters around me, including my doppelganger brothers and sisters scattered around town, them I can converse with. Mmmmm, just be yourselves. You are cats, after all, and therefore automatically charming and intriguing to humans, whether you are real or imaginary. When I first started in the detective game I wanted so badly to be a street-wise dude like Midnight Louie but I couldn’t pull it off. I can study his techniques all I like but I simply can’t pull off a black fedora the way he can. Most cat characters don’t have the infestation of supernaturals we have here on the Olympic Peninsula where I live. Once that lady let the sparkly vampires out of the bag, the others took it for an open invitation. Very interesting. You are quite a unique cat character, and I agree that all us cat characters need to find our own niches. You seem to be doing well with the supernatural gig. My author plans to do another full-length book soon, and maybe a collection of my short stories when she–er–collects enough. If she doesn’t get back to me soon I am going to have to ever-so-carefully insert one claw into her bare leg while she’s writing about somebody else. Currently, I am being upstaged by a bunch of dragons. MOL (Meow Out Loud). I know what you mean. My author is working on other projects right now, too. I need to get her focused back on my books after the summer. I hate to use violence to get her attention, but maybe a quick claw jab would do the trick. Plus we have our WordPress blog where soon we will feature you, Sneaky. Like you, we like to interview other cat characters and have particularly sought out cats our readers might not have encountered before so we encourage our readers to read all of our blogs. Pawsome! It’s great for me to be in the interview chair for a change. It’s been great having you here, Spam, and best whiskers to you on your upcoming purranormal adventures and your author on all her other writings. 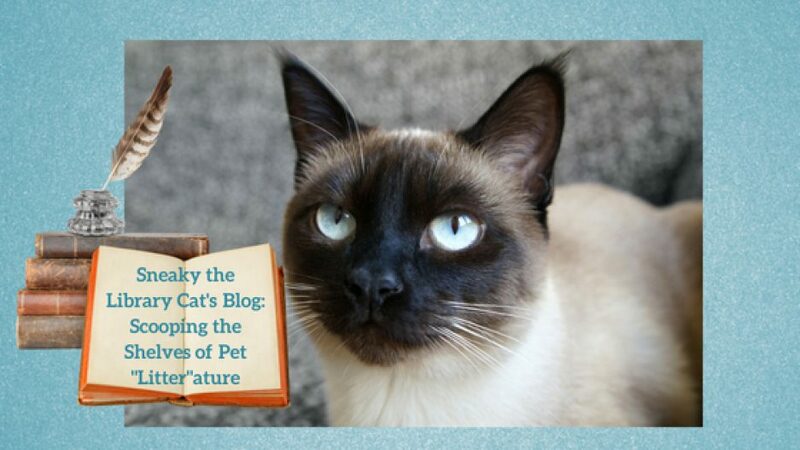 Now I have no right to complain, but we cats can be very noisy when we want to be, and Siamese cats like me and my author’s cat, Oliver, are one of the loudest “talkers.” Turn up your audio, and listen to these three videos of cats having their say. Today, I am honored to interview a real-life rescued cat. As those who have been reading this blog or my mystery series, you will know that I was also rescued by the kind people at the Cobble Cove library. Of course, I am not a real cat, so I am very interested in hearing a first-hand account from one who has experienced this wonderful act. So let’s proceed. What is your name, and your author’s name? My name is Rama! I also go by Rama Dasa, Dasa Dude, Dude, and a bunch of other cute nicknames that my human gave me. I am a sleek black cat and I love to move like a panther. I look like I’m very sure of myself and my size can be imposing, but I have a sweet, vulnerable side, too. My human and author, Catherine (Cat) Holm, wrote a story about me in Rescued, The Stories of 12 Cats, Through Their Eyes; the story is called “Sideways” and it’s about how I came to learn to trust humans again. Apparently, this story moved a lot of people, because it won a big award (The Cat Writers’ Association President’s Award in 2016)! That’s pawsome. My author is also a member of CWA. The book that I have appeared in so far is Rescued: The Stories of 12 Cats, Through Their Eyes (edited by the amazing Janiss Garza). My story of rescue (“Sideways”) is one of 12 stories in this anthology. All these rescue stories are told from the point of view of 12 different cats. My author may have future plans for me in a book, but she’s keeping it secret for now. The spirit cat Target (who is also black, and who shows up in “Sideways” to try to help me out) is a big character in my human’s cat fantasy fiction novel The Great Purr. My human also wrote a memoir called Driving with Cats: Ours for a Short Time. She writes about my journey toward becoming more trusting, and she compares the journey to picking berries in the woods. How strange is that?! Your author sounds very talented. I am sure you are as proud of her as I am of Debbie. Writing about cats, both real and fictional, is truly a work of love. Oh yes. I am completely authentic and the story is completely true! My human took some magical liberties in the story “Sideways” when the spirit of Target confronted me under the bed, but the rest of the story really happened. Praise Cat, the rumbling of the car ceased a few moments later, but I could see cars all around us in a lot and a large building nearby. We couldn’t be home yet. The man got out of the car, and the woman remained. She pulled the cat carrier closer to her. I felt the growl beginning in my throat, again. I showed her my teeth. She did not have the bad smell of the male who had left me locked in his apartment. But, still. A human had to be shown. “I am NOT Target!” I screamed, but to my knowledge, no human speaks cat. She backed up slightly, alarmed at my howling. But then, she leaned forward and opened the latch. The gall! She opened the door. I hissed, and backed up in the carrier. Gave her my best steely glare. She looked into my eyes, her own eyes watering again. “Okay, I know you’re not Target,” she said. Very mice excerpt. Thanks for sharing it. Some of us have a very hard time coming to trust humans. I think my human did a good job of capturing my gradual journey from complete fear and insecurity to gradual contentment and trust. Indeed. Are you a talking cat in your books or just a silent one like I am who just meows occasionally? I talk, for sure! But I’m not a blabbermouth. I only say what is needed. I am never a loud or mouthy cat, although I do have a passionate, insistent little sound I make when I am hungry. Food is a great pleasure of mine. As it is for all us cats. What advice would you give other cats and cat characters? Find your true voice and stick with it. Every cat has a unique personality and this comes through in how they talk and how they are portrayed in writing. My human is working on two books that I will be part of, but it’s way too soon to give a date! One book is a memoir about our big move from Minnesota to Vermont, more than 3 years ago! The other book is another cat fantasy novel, which will take place in both Minnesota and Vermont. My human loves to write about cats and places! Thanks. It was a pleasure to speak with you, Rama, and best whiskers to you and your author on your upcoming books. Thank Bastet It’s Friday. For your mewing pleasure, I am posting two videos about cat breeds today. The first features the 10 most friendliest family breeds (Siamese is #6). The second shows the 10 most beautiful felines (Siamese is #5). Enjoy and have a mice weekend. Meow, there. It’s been a while, but I finally caught an interview with a Fish. Actually, he’s a cat, but his name is Fish. We will find out why in a little bit. Welcome, Fish. Please tell us more about yourself and your author, and I am really curious as to why you are called Fish. I am Fish and I was fished out of a fish tank and taken home by Granny. Who thought cats couldn’t swim? I guess that is why Granny named me Fish because I was fishing for those Goldfish in that tank. My author’s name is Julie but she has her own shysters so I ignore her because shouldn’t she stay loyal to me? Very interesting. What book(s) have you appeared in? Please list them and their genre. I am so busy. I am the first of Granny’s pets and I help her in all of her books along with the whole menagerie she has adopted. I am in Granny Hooks A Crook, Granny Skewers A Scoundrel, Granny Snows A Sneak, Granny Forks A Fugitive and Granny Pins A Pilferer. They are unique cozy mysteries. Wow, Meow! My author writes cozies, too, and there are some old people in them like Mac and Betty. Can you tell me more about your series? I am in the Fuchsia, Minnesota series. My owner Granny is a cantankerous old woman. She’s a little forgetful but more so when she wants to hide something she is doing from her adult kids. We have an entire neighborhood along with her kids who help her get in trouble. It seems we have a tidbit of crime in Fuchsia. I could go for a tidbit right now. A tidbit is also a treat and I love treats. Granny doesn’t know, that I know, that she hides her chocolate under my bowl. It’s a good thing I don’t like chocolate. Sorry I got sidetracked, now back to the story. Who would think Granny and her weird neighbors would fight crime? And crime hides in strange places. Did you know criminals look normal? And the weapons she uses are amazing. She used an umbrella and a knitting needle, a snow shovel and a pitch fork plus a hat pin to catch those nasty people. Of course all of us shysters help her. She calls us shysters. A couple of times she almost got all of her friends killed. It is a good thing I have nine lives. The longer I’ve known her, over all the books, I found out why she is the way she is. Her past life holds lots of surprises and she falls in love but she changes her mind a lot on who she is in love with. Who knew you could fall in love when you are old. Is there anything more you want to know? If so you will have to check out the author’s books. I need to go find a tidbit. You made me hungry. MOL – Meow out loud. To answer your question about old people falling in love, people of all ages fall in love in my series and also get involved in mysteries. John and Alicia aren’t old, but they are not young either. Mac and Betty, on the other hand, are in their 80’s. I guess anyone at any age can fall in love in books as well as in real life if that answers your question, Fish. Now here’s another question from me. Are you based on a real pet such as your author’s? If so, please give further details. I started out to be based on my author’s grandkitty Buster. He was rescued by my author’s daughter. Someone left him out in the cold and he lost part of an ear, part of a paw and part of his tale but he isn’t Siamese so I am combined with him and my author’s Natasha who is a real troublemaker. Fish needed to be fed. Fish was the cat Granny rescued from a fish tank at the pet store. She happened to be walking by the fish tank at the pet store when she felt water hit her face. Looking closer at the tank, she found a huge alley cat floundering in the fish tank. When Granny reached in to save him, he thanked her by tattooing her arm red with his claws. Granny then and there knew that this cat was the cat for her. Granny took the cat to the employees to purchase him and the employees informed her that this cat was free. He didn’t belong to the pet store. He snuck in every day and tried to fish out the fish from the fish tank. Occasionally, he would crawl in and have to be rescued. They would be glad to be rid of him. Granny promptly named him Fish and took him home. Fish had a personality of his own. He was feisty, lovable and was always bringing a new and unique present home for Granny to see. One night he thought Granny needed a new bra. Fish was aware of her nighttime attire. Who would have thought a cat could notice what someone wore. Fish, in his wandering, brought Granny home a hot pink, polka dot, padded bra. The only problem was that it was a 40DD. Granny could have only wished for those kinds of assets. Fish was not your average looking hulk of an alley cat. Somewhere along the way, Fish had lost part of his tail, part of one of his ears and part of a paw. He was an unusual looking guy and when he pose, he looked as if he’d been out on an all night alley catter binge. He always looked a little tipsy. Fish used the cat door most nights to wander around the town. Granny didn’t worry about him. Before she left for her day, she would leave his food in his bowl and when she got home Fish would be waiting for her along with the latest present he had acquired for Granny. Very mice. What do you like most about your role in your authors’ books? We keep our humans on track. We find clues. Plus in Fuchsia animals can roam the streets so we have a bird’s eye view. Well, maybe I don’t, but Radish the parrot does, so we can sneak and watch people and drop clues at Granny’s feet. She couldn’t solve a crime without us. Actually don’t tell her that. She thinks it is her but it is really us and we let her take the credit. That’s quite humble of you. I and my canine co-star, Fido, don’t actually solve crimes, but we do lead our human characters to clues that help them figure mysteries out. We don’t talk except amongst ourselves. But…we understand and we use sign language with our paws to get our point across when we need to heard. We have a choir when we all get going. Furball and I meow, Tank, Little White Poodle and Baskerville bark and howl. Mrs. Bleaty bleats and Radish squawks. We may go on tour with our choir sometime. I save my louder meows for when I want to be fed. Since I live in a library, I need to talk in my inside voice. However, I have other methods to get my messages across, such as in my first mystery where I pretended to use a cardboard box as a scratching post because I wanted Alicia to find some letters. Let your owner think they are the boss. Look at them with adoring eyes and you will have them wrapped around your little paws and then they will do anything for you. Sometime this year the sixth book in the Fuchsia, Minnesota series will be out. The second book in the Brilliant Series will be out soon. It takes place in Birlliant Minnesota which isn’t too far from Fuchsia. We haven’t traveled there yet because we have been warned by Granny that there are two cats, Mrs. Mysterious and Mr. Shifty, and two dogs, Max and Jasperine that are predators and we would be in danger and this is one time we think we should listen to Granny. Excellent. There are 3 books in the Cobble Cove mystery series, but my author is planning a fourth soon. She also has another cozy mystery series in mind. Of course, they will all feature pets because what is a cozy without a pet character? Thanks for sharing your authors’ links and for answering my questions. Best whiskers on you and your authors’ upcoming books.